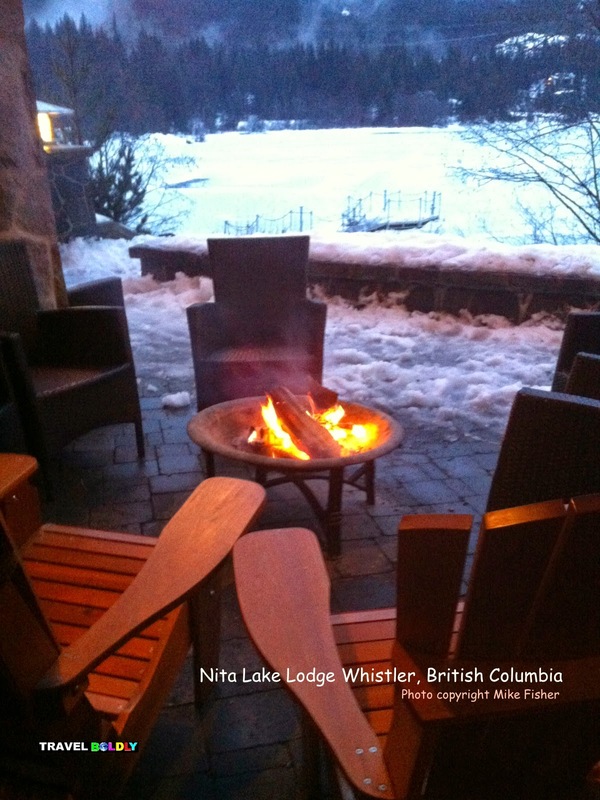 Winter or summer Nita Lake Lodge in Whistler, British Columbia is a picturesque place to spend some time. Injuries can reveal character on the road. More importantly for travelers, they can show establishments’ true colors. I explored Vancouver and the mountain ski town of Whistler with my arm in a sling. As my throbbing shoulder worsened, I became a 5-foot, 5-inch Napoleon hurtling toward my West Coast Waterloo. 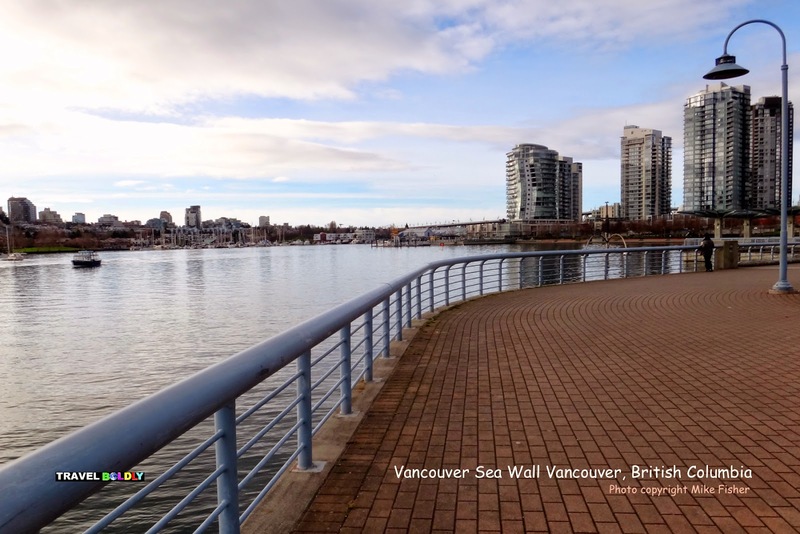 offers changing perspectives of the city’s waterfront. Clumsily poking with a chopstick at artfully seared sushi in Yaletown, one of Vancouver’s hip neighborhoods near the waterfront, I learned adventures often hand you what is buried deepest inside. In my case, it was a Napoleonic complex that reached full bloom a few days later when I demanded that the room refrigerator (a welcome touch at luxurious Nita Lake Lodge in Whistler) be unplugged. Most people wouldn’t notice the low-hum noise that switched on and off, but I was crazed. As a pleasant hotel maintenance man visited my room, the pain of the rotator cuff injury that had kept me awake spiked and I bared my teeth like a junkyard dog. In the end, before admitting defeat by going to the Whistler hospital emergency department, I could only raise my right arm by pushing it up with my left; an angry puppet with a broken string. as you overlook lakeside at Nita Lake Lodge. It’s one thing to travel boldly when well, quite another to flail on the road when injured. If traveling with a bum shoulder brought out the worst in me, here is the beating heart of my tale: it brought out the very best in the hotels, bars, restaurants and their people. 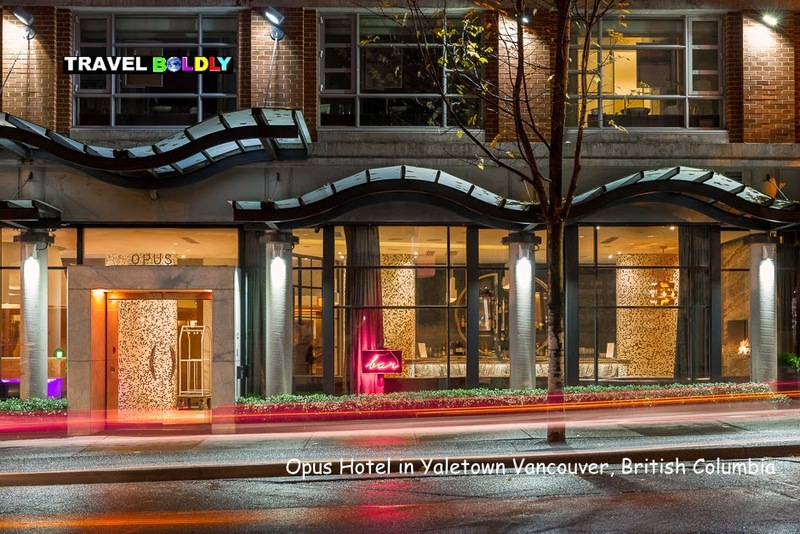 OPUS Hotel Vancouver (named one of the Top 5 Trendiest Hotels in the World by TripAdvisor) is in the heart of Yaletown, a thriving neighborhood chockablock with pubs, eateries, shops and boutique hotels. 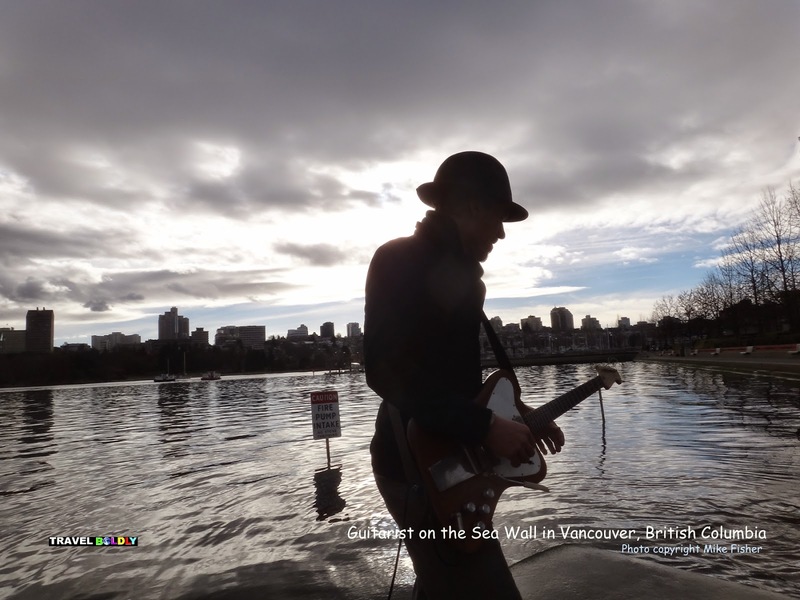 It’s just a five-minute walk to one of my favorite Vancouver attractions, the 6-mile (8.8 km) seawall overlooking the Pacific Ocean, where you can run into an electric guitarist playing ambient music at ocean’s edge. This hip property rocks in every possible way, aside from being the only Four Star Forbes boutique hotel in Vancouver. For eats and drinks, Yaletown is a multifaceted gem, but you don’t even need to go outside OPUS hotel in Vancouver. some stones, he seemed to float at the ocean’s edge. In the OPUS Bar, revamped in the past few months with Venetian plaster, bass thumped beneath the clank of mixers and shakers, the din of conversation and the clink of glasses. It’s a cool place just to chill. Barry the chief mixologist whipped up a King George cocktail (rye, grapefruit bitters, Campari) and later that night, there was a DJ. La Pentola features Italian family-style, which means heaping plates that come to the table in waves. For dinner, the restaurant was full, patrons passing plates and bantering in a room accented with white tile, dark wooden tables and copper pots on the wall the chef brought back from Italy. shops, cafes, restaurants, spas and Vancouver’s waterfront. Can’t Miss Dish: Sablefish, chanterelles, fennel and grilled scallions. The menu is seasonal so choices are going to change accordingly. Wine lovers will love this place, as the restaurant was the Wine List Award Gold Winner at the Vancouver International Wine Festival in 2014. So, yeah, the eats and drinks and boutique charm and even the complimentary in-room iPad at OPUS are a few reasons I love this property. Major plus, I’ve got dogs, too, and it’s pooch friendly. 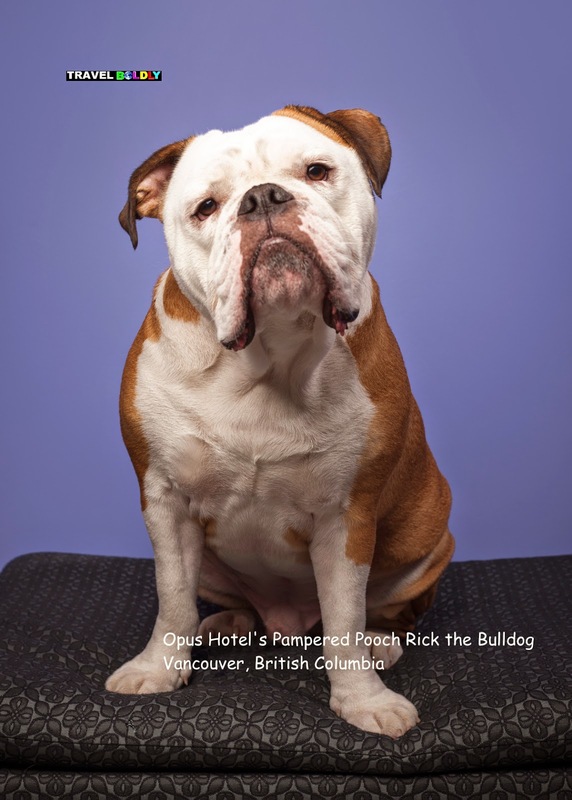 What really makes OPUS special, though, is the exceptionally attentive staff. Nathan, a former lifeguard, learning that I had shoulder problems, went out of his way to ensure I had bags of ice to cool the inflammation and recommended – this was huge – that I immediately put my arm in a sling. He shared that he had a mountain bike injury in the past, so he’d had experience he could pass onto me. Then Patrick drove the property’s new Jaguar to a downtown pharmacy to get an arm sling and much-needed Advil. Every time I left my room, the staff would ask how I was doing, knowing that I was hurting. That kind of help goes a long way with me. If you’re on the road and ailing, it likely will with you, too. As my shoulder burned, so did my temper. I asked for a room change when I couldn’t sleep and was accommodated without difficulties. It was all about me, in the worst possible way for those who had to bear it, but OPUS went out of its way to ensure satisfaction. There are more than 600 sushi joints in Vancouver (hey, it’s right on the Pacific Ocean). If you are going to discover Yaletown and grab a bite, try Minami Restaurant. It has a sake sommelier and specializes in seared sushi. If you want a quick spa break, give Skoah a shot. Hawksworth Restaurant and then try to make a safe landing. 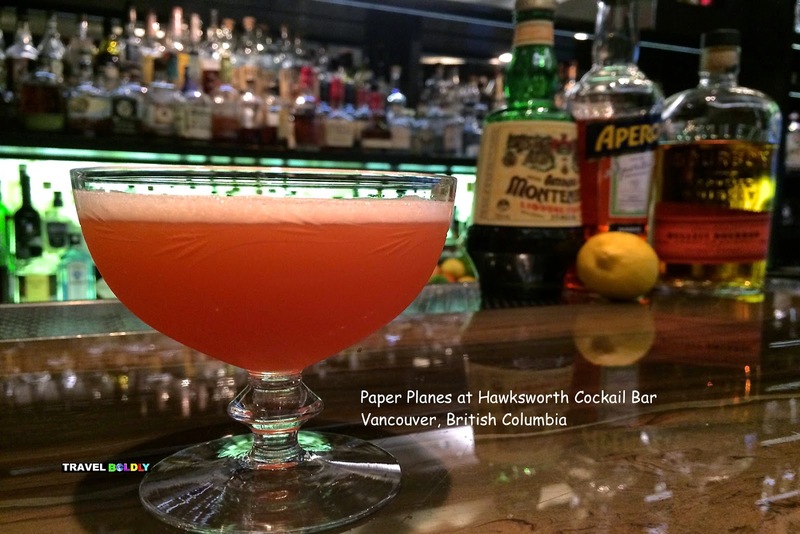 Go a bit further afield for an upscale dinner and try award-winning Hawksworth Restaurant. I’m a new fan of its Paper Plane (1 oz Bourbon, 1 oz Amaro, 1 oz Aperol, 1 oz fresh lemon juice, SHAKE, double strain, serve up in a chilled coupe). It’s also Chef David Hawksworth’s fave cocktail. Can’t Miss Dish: The roast venison strip loin with crispy spatzle, squash, salsify, and sweet and sour nage, was one of those dishes where every bite was wow. The menu is seasonal, but I hope this one has staying power. When I blew off urban chic for a mountain retreat, it was by taking the express bus to Whistler, about a two-hour coach ride from Vancouver. 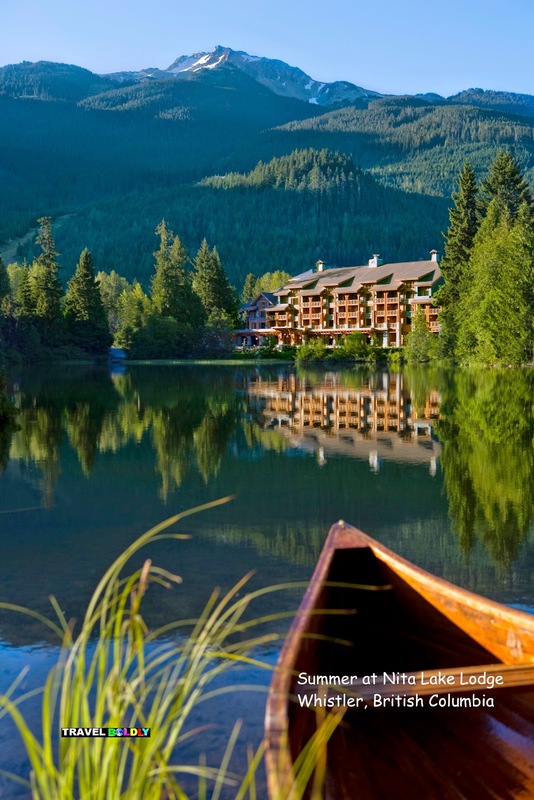 Arriving at Nita Lake Lodge, which sits right on the calming waterfront, is like landing on a tree-buffeted oasis. It’s got old-school mountain charm and a wilderness vibe that you can find throughout British Columbia. Hello BC! There is a cozy, stone hearth fireplace where you can curl up almost as soon as entering the lobby. The Cure Lounge, which overlooks the glacier-fed lake, is where I tried to find my own cure, washing down house-marinated olives with beer. Nita Lake Lodge is superb. Aura Restaurant for dinner was mind-blowingly good. 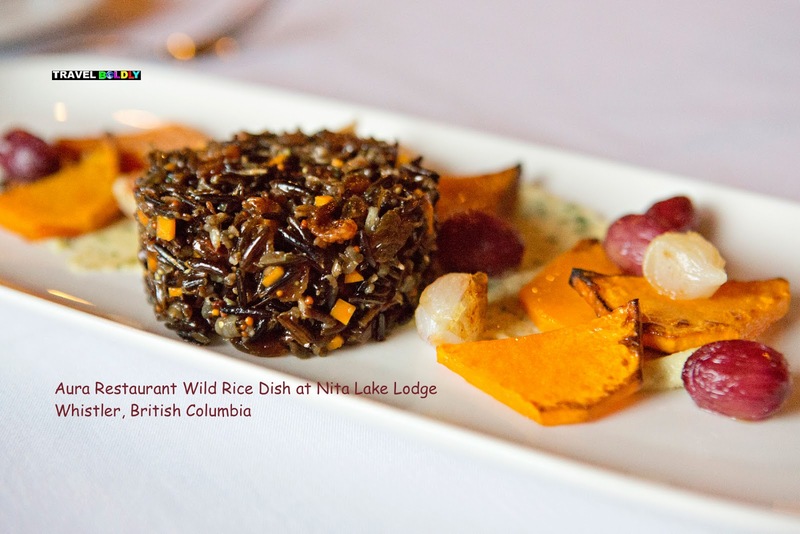 Can’t Miss Dish: Among many exceptional dishes, Executive Chef Dean Hossack’s Wild Rice Salad is a tasty vegan dish (and I’m no vegan), served with chilled and warm components. On the base of the dish is herbed cashew spread, flavored with nutritional yeast flakes and fresh lime juice. Wild rice, raisins, diced butternut squash and chives comprise the salad and the dressing, whoa. Again, even more than the food, drinks and wilderness retreat vibe, the employees at Nita Lake Lodge really make the place. When there was a wedding at night and a conference during the day, the lodge ensured I was taken care of. Even when I had to go for urgent care because of the pain, the shuttle driver took me there and picked me up. on the lake or a hike in the mountains. Here’s a caveat: I was on a press junket that included both OPUS and Nita Lake Lodge. So was I getting special attention because I was media? Sure, maybe. Though I believe any guest would get the same caring treatment. 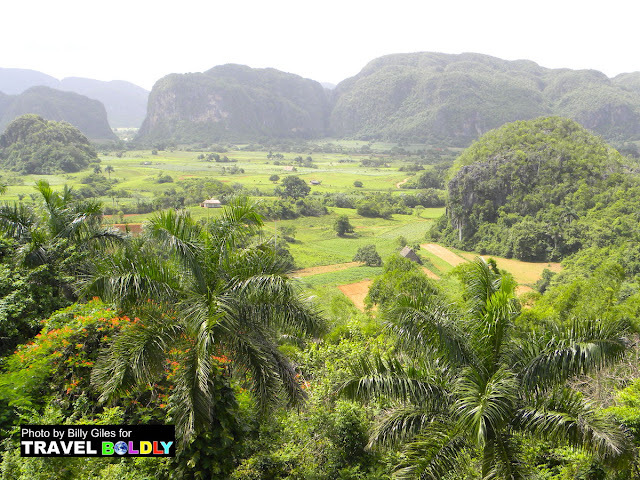 Both properties are managed and staffed by good people. The lesson I learned is that it’s never too late to rely on the kindness of strangers, especially when travelling (even if, yeah, you’re likely paying to stay at their place).